Today, we continue our citywide tour of Newark Cemeteries. Fairmount Cemetery, founded in the fall of 1853, is Newark's largest cemetery. Located between Central and South Orange avenues and South 12th and 19th streets, it contains more than 150,000 graves, covers 100 acres and also has a mausoleum built in the 1920s that has 3,000 burial units. There also is an outdoor mausoleum near the cemetery office. The Fairmount Cemetery Association was founded to be sufficiently large for 'many coming generations and commensurate with the growing importance of our city and the adjacent villages.' In a brochure, the cemetery was described as being of 'dry sandy soil never occupied save by natives of the forest, and located on a tract about one mile from the court house.' The cemetery is a public, non-profit and non-sectarian operation that devotes its income to the care of its buildings and grounds. Surpluses are put into a fund to meet future needs. The first burial at Fairmount was that of 24-year old Lewis J. Pierson of Newark. Today, there are approximately 800 or more burials annually, mostly of adults. In the early days, many children who had died of whooping cough, consumption, brain fever or typhus were buried at Fairmount. As times changed and the health conditions improved, the ages of those buried rose. Longtime cemetery superintendent John W. Good worked there for 50 years. He was named assistant superintendent in 1907 and became advisory superintendent in 1942. Good estimated that 40,000 funerals took place during his tenure. In his lifetime, he also saw machinery replace manual labor with the introduction of lawnmowers, automatic coffin lowering devices and mechanical gravediggers. Good also observed the public's attitude toward cemeteries in general: 'In the old days when a family paid a visit to a grave here it was an all-day affair. They came by horse and carriage or by streetcar and they brought their lunches. Declaration Day was especially popular.' The car, world wars, the Great Depression, and the changing status of the family and women all contributed to less frequent or even no visits. Fairmount, like Mt. Pleasant Cemetery, has several notable features which make it distinctive among the city burial grounds. It is essentially a Victorian/rural cemetery laid out with trees and shrubs beautifying the rolling landscape. It also has several distinctive mausoleums of prominent former Newark beer barons, and it has two multiple grave sites—one of military personnel, the other final resting place of the Newark settlers removed there from the Old First Burying Ground. A stroll, walk or drive around Fairmount produces a large number of German sounding names among the interred. Essentially, they represented the growing 19th century mercantile business community. Two in particular would be recognized by anyone familiar with the beer kings: Feigenspan and Krueger. Their burial chambers occupy important corners in a parklike setting. Christian Feigenspan's tomb is a classical temple faced with four delicate Ionic columns. Gottfried Krueger's mausoleum, set apart, is the park's grandest structure with an exterior executed in Vermont granite and an interior of Italian marble. The shafts and pilasters are of Btowah, Georgia marble and the sarcophagi are of Knoxville, Tenn., marble, and the statuary is of Carrara marble. Doors, windows, ceiling decoration and part of the dome is trimmed in bronze. The building's interior contains 36 cells and two sarcophagi and the building points due east. The entire structure cost $95,000 and is similar in size and grandeur to the John Dryden mausoleum in Mt. Pleasant Cemetery. So significant was the structure that it was written up in an article in American Architect and Building News in 1899. A second unique feature of Fairmount is the National Cemetery section, originally intended to be the burial location for Civil War veterans. Many were patients in Marcus Ward's Newark hospital. Later local soldiers from the Spanish, First and Second World wars, Korea and Vietnam were been buried there. A third distinctive monument is the Newark Founders' Monument, a large statue of Robert Treat placed over a vault containing the graves of Newark's earliest settlers moved there from the Old Burial Ground, the first cemetery of the city's oldest church. Other occupants of note include P. C. Clark of the famous thread family, whose marker is a bronze seated figure atop a pedestal, and Joseph Dixon of the Civil War era. Dixon owned the Dixon Crucible Company of Jersey City which developed the Dixon pencil during the war period and made it possible for men in the field to carry a writing implement into battle for the first time. It was very important at a time when written orders could be given only with a cumbersome straight pen and ink bottle. G. Frederick Hoffman of the well-known Hoffman Beverage Company is also buried in this cemetery. A large brown bottle can still be seen in the distance over the now-abandoned Pabst Brewing Company on South Orange Avenue near the Garden State Parkway. Clara Maass, the heroine nurse of the Spanish-American War, is interred in Fairmount as are Representative Fred Hartley of Taft-Hartley fame and Charles E. Nichols, former president and founder of the American Cemetery Association. The Stratemeyer family is also there – the family famous for the Bobbsey Twins and the Rover Boys. Woodland Cemetery, which is among Newark's oldest cemeteries, first appeared in the pages of the Newark City Directories in 1865, but it may have actually been in existence as early as 1846. It covers approximately 60 acres and appears to be a pie-shape or triangular area. Located slightly west of Bergen Street, the cemetery is surrounded by Rose Street, Rose Terrace and South 10th Street. Today it is the resting place for approximately 70,000 German-Americans, Europeans and African-Americans. Plots are no longer available for purchase, and the only graves opened now are lots purchased years ago. The fact that people no longer are buried there is part of its present predicament; its source of revenue has evaporated, and money is constantly needed for its annual maintenance. 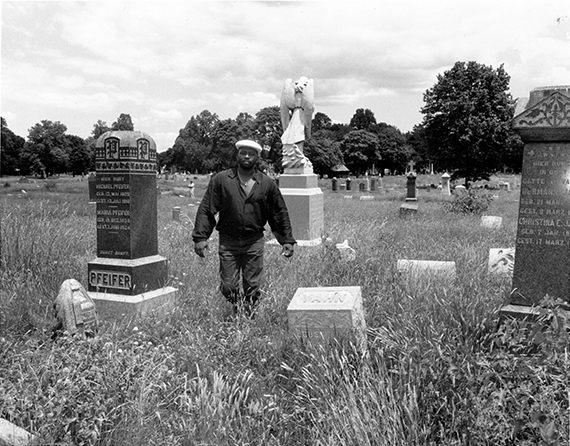 In the summer of July 1994, the condition of the cemetery reached a new low. Evelyn M. Hayden of Bricktown visiting the cemetery commented 'I stand four feet, eight inches in height and when we were trying to find the grave of my sister, I couldn't see the stones. Some were knocked over, which saddened me greatly. One would need a trailblazer to find the way to the graves. It was that bad.' In response to this and other complaints, Jerome Muhammad, a local resident whose father is buried at Woodland, took it upon himself to help bring about a turnaround of the conditions. His father and the sister of Evelyn Hayden were not the only ones abandoned. So were 70,000 other Woodland inhabitants. The Friends and Family of Woodland Cemetery was established and volunteers were enrolled to help in cleanup operations. Since burial plots were no longer a source of income, other forms of help or aid needed to be identified. In 1996, the New Jersey International Society of Arborculture pitched in to help. The International Youth Organization and Newark Fighting Back also offered their services. Agnes Wolf, a volunteer who became a project manager, also has taken an active role in the turnaround. The Orange Garden Supply Company was hired to take care of the grounds. Sod was removed from the paths and roadways, local residents were recruited to begin the ground work. Tons of garbage were trucked away, and more than 1,300 tombstones were moved back into place. Much has been done to return respect to the great old German burial ground, but much still remains to be done. A recent drive through the grounds found the Victorian lodge and office badly in need of repainting. The tower remains one of Newark's most enchanting. But the most massive job that remains to be done is the uprighting of thousands of monuments. Simply put, this massive memorial to Newark's 19 century German-Americans and others bearing names such as Schweikert, Hunkle, Helmstaedter, Scholenamascruer, Kaudenbach, and Schoenewolf who did much to create last century's industrial and commercial Newark, needs to be polished for future generations.